From your old towels and linens and some lovely Spoonflower prints, you can create a beautiful, sturdy, and– most importantly– warm comforter for a family in need! Please join us in the Greenhouse on Tuesday, October 8, from 6-9pm, to make upcycled comforters and pillowcases for refugees supported by Church World Service Greensboro! Church World Service Greensboro has been offering support to newly resettled refugees in the Triad for over 30 years. Part of their mission is to provide basic needs support in the form of household goods, and with colder weather upon us, this is the perfect time to create attractive and warm bedding from older donated linens. This event is the perfect opportunity to put your sewing skills to good use by creating something beautiful for someone in need, and you'll learn how to create a DIY upcycled comforter from used linens with hands-on instruction! 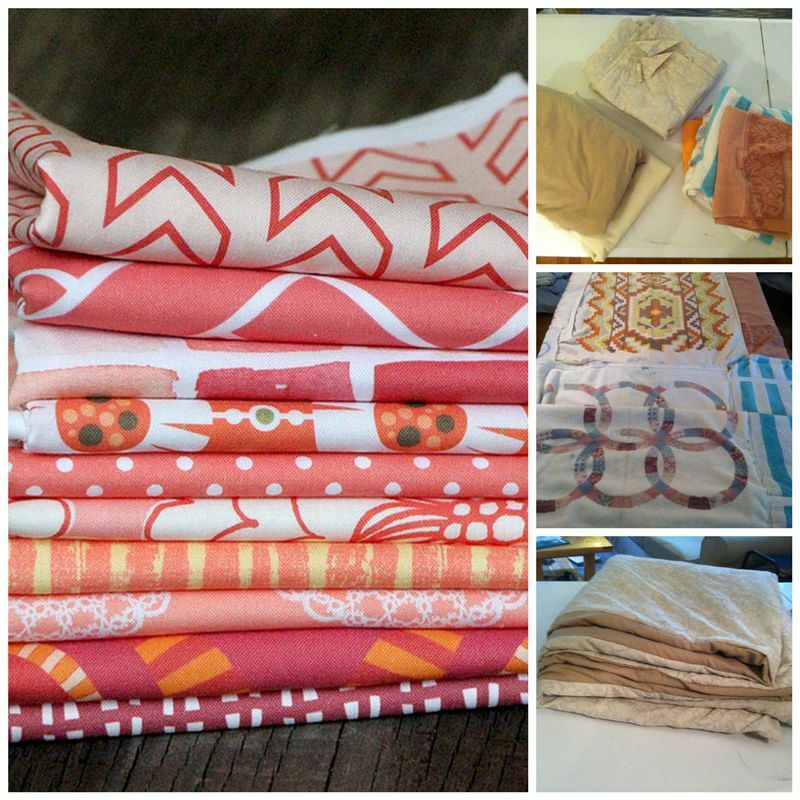 We will provide recycled fabrics + Spoonflower prints for piecing and binding, thread, and a basic tutorial for making comforters and pillowcases, as well as hands-on help. If you can't stay for our sew-in, you can still help with this effort! Please feel free to bring any donations of used (pre-washed) sheets, blankets, mattress covers, and any other large pieces of fabric that you might have to the Greenhouse during any upcoming event before October 8. All donations to CWS Greensboro are greatly appreciated! Head over to Meetup to reserve your spot in our sew-in today! We’ve reached day 6 of our 12 Days of Giveaways, and are taking a slightly different direction today with our prize. Today’s giveaway is a $200 donation to the winner's choice of the following charities: the ASPCA, Heifer International, Kiva, Susan G. Komen for the Cure, or the American Red Cross. The ASPCA (American Society for the Prevention of Cruelty to Animals) works to prevent cruelty to animals and to pass humane laws, and shares resources with animal shelters. Heifer International works to end poverty and hunger around the globe by providing families with livestock and training that improve nutrition and generate income in sustainable ways. Kiva provides microloans to low-income people around the world who might otherwise not have access to the capital needed to found and sustain small businesses. Susan G. Komen for the Cure is dedicated to the eradication of breast cancer around the world and funds scientific research. The American Red Cross provides disaster relief in the U.S. and around the world, helps provide support to American military families, provides health and safety training, and facilitates blood donation in the U.S. that comprises 40% of the total U.S. supply. Enter this donation giveaway before 8:00 am EST Thursday, and we’ll announce the winner a little later the same morning. Good luck to you all and even if you don’t win, we hope you’ll consider donating to one of these worthy charities anyway! The winner of yesterday's giveaway for a handmade kid's sewing kit and a copy of the book Sewing School is Ren Thones. Congratulations, Ren! Our North Carolina fall is finally here and I’m starting to think about holiday projects. Here at Spoonflower we prepare to put our crafty hands to work for our own family and friends and wouldn’t it be lovely to share some of the handmade goodness with kids in need. One of our favorite Spoonflower designers, SammyK, brought our attention to the Mirabel Foundation, a children’s charity based in Australia, that accepts handmade soft toys to donate to Mirabel children in their annual Softies for Mirabel drive. As encouragement for the Spoonflower community to get involved we are hosting a giveaway of 15 cut and sew plushie patterns with hopes that the winners will sew up the toys then send them to back us so we can ship the lot on to Melbourne. Enter by Tuesday October 25th 12:00 PM EST and the winners will be announced on Wednesday, October 26th. Please return completed projects to Spoonflower by Wednesday November 23rd. Not a winner? Don’t fret, we hope this giveaway will serve as inspiration for everyone to get involved! 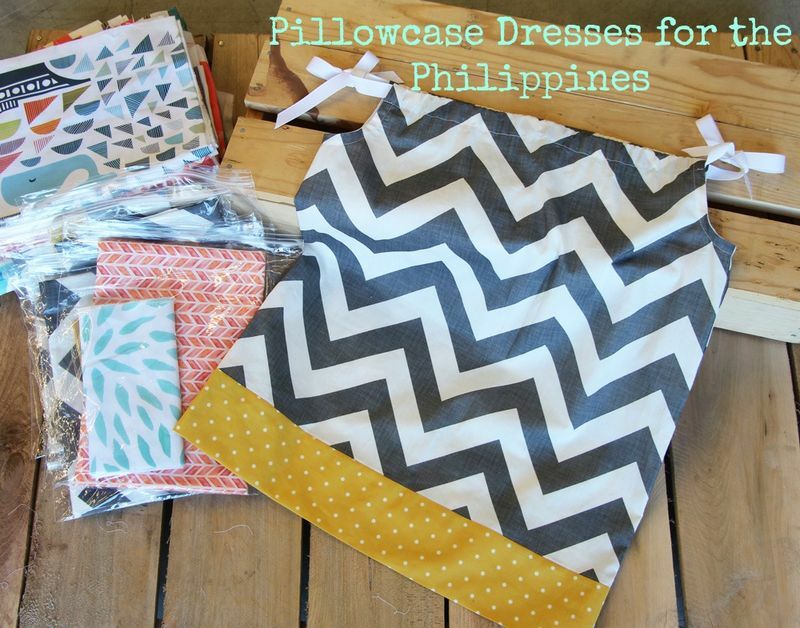 Let’s put our needles and thread to fabric and create special gifts that the kids will cherish. Keep up with the drive details here to find out when and where to send handmade toys of your own. Thanks so much to all of you who participated in Spoonflower's 3rd annual Free Swatch Day! It's all over now but the mad printing, cutting, packing and shipping. We gave away 7,300 swatches of fabric and raised a total of $2500 for Heifer International! Thank you, thank you, thank you, everyone! Don't forget to join us on our Facebook page! HOW DOES IT WORK? This offer is limited to one swatch per customer. To activate the discount, just add a swatch-sized piece of fabric to your shopping cart between noon EST on Thursday, August 26 and noon EST on Friday, August 27, then proceed to checkout. The discount will be subtracted from your cart total automatically. Note that in order to receive your swatches, you need to follow the transaction through to the order confirmation page. [And yes, shipping is free, too.] This offer works for your own designs or for any of the designs available for sale in the Spoonflower marketplace. 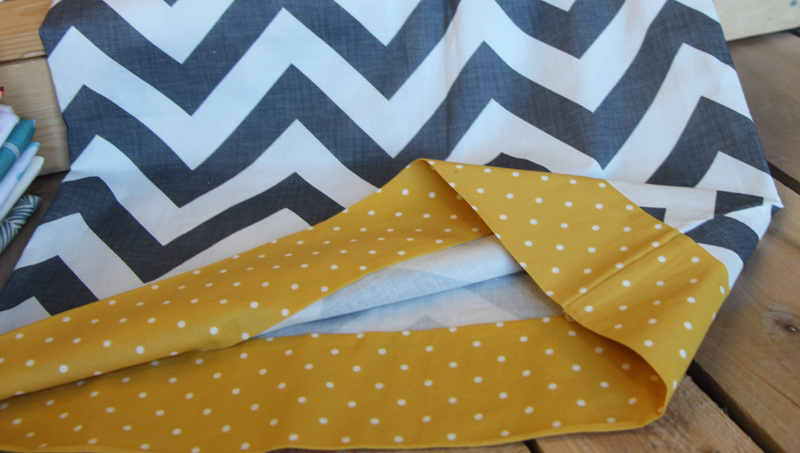 PRINT YOUR OWN DESIGN: If you're new to Spoonflower this is a great chance to test the quality of our fabric and our printing for free. Just go to the Spoonflower home page, click Get Started, upload one or more designs, click on your design and then follow the instructions above. SHOP FOR FABRICS BY INDIE DESIGNERS: Instead of printing your own fabric, choose a free swatch from any of the thousands of unique designs in the Spoonflower marketplace. TRY A NEW FABRIC: We currently offer six base fabrics to choose from, including quilting cotton, organic cotton sateen, organic interlock knit, upholstery-weight cotton twill, linen-cotton canvas, and cotton lawn. Read more about our fabrics. Spoonflower is still a small company. This our second Free Swatch Day. The first time we did this was a year ago when Spoonflower was an even smaller company, but we've decided once again this year to try to take the opportunity to do something worthwhile. While we don't yet have much in the way of extra cash that we can direct toward organizations that promote ideas we value like sustainability, we are wealthy in one respect. 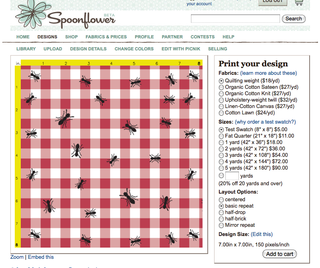 Spoonflower is the hub of a large, well networked community of over 100,000 amazing, creative people. So we've decided to give everyone who takes advantage of Free Swatch Day on Spoonflower the option to take the $5 they would normally pay for a swatch and instead to make a donation to Heifer International, an organization that provides livestock, training and services to small farmers and communities around the world. When you enter the shopping cart with your free swatch you'll see a donation box on the check out page where you can fill in any amount you'd like to donate to Heifer.org, click a donate button, and see the donation amount added to your cart total. We'll report on the amount raised throughout the day on our Twitter feed and our Facebook page as well as on the Spoonflower blog once it's all over. What is a swatch and why aren't they always free? A swatch in this case is an 8 inch x 8 inch square of fabric custom printed with your design. Printed swatches normally cost $5 each. If you just want a sample book of unprinted fabric to see what it's like, we can send you that anytime for $1. The order form is on our fabrics page. Can I email you an image to print? 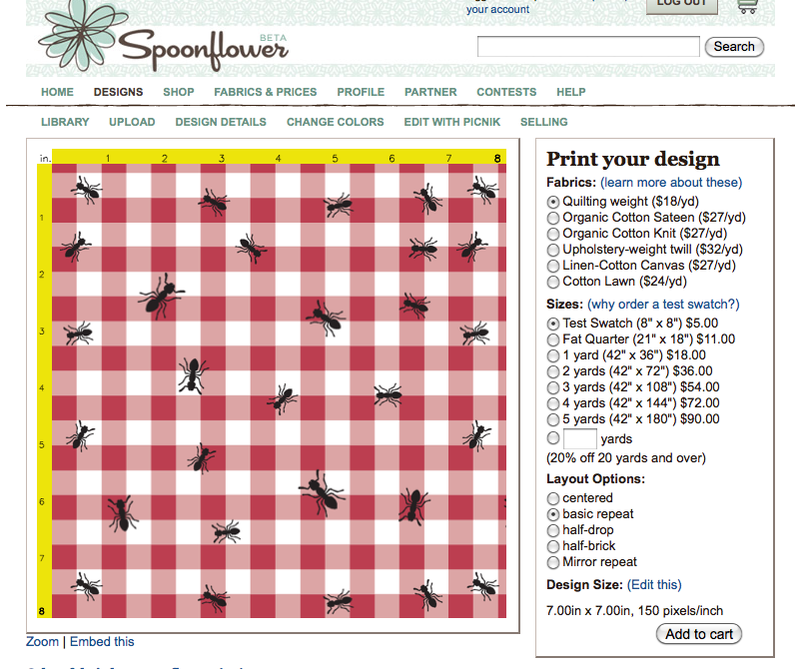 To take us up on our offer you have to use Spoonflower to create and order your swatch. That means uploading your (original) design or photo to a Spoonflower account, choosing your fabric and repeat style, and checking out using the instructions listed above. Do I have to make a donation to Heifer? A donation is entirely optional. If you have another organization you'd like to support with a $5 donation, do that instead. You don't have to donate $5, either. Donate in any amount you like. Read more about Heifer. How can I track my donation? The downside of raising money through Spoonflower is that we can't offer the ability to monitor and track your contribution and we can't offer you a receipt for making a tax deductible donation. We'll keep everyone informed about what we're doing on our blog, but if you want real accountability then by all means leave the donation box on your Spoonflower checkout page blank, then head on over to Heifer.org and make a donation yourself on their secure site. If you have a question that we have not answered on this page, please feel free to contact us by emailing help@spoonflower.com. Just in case you missed the hullabaloo yesterday when we announced that Free Swatch Day would take place on Thursday [thus befuddling the 50% of the population who get halfway through the week and manage to convince themselves that it is already Thursday… me being one of them], today really is Free Swatch Day on Spoonflower. That means that up until 11:59 pm Eastern Time you'll be able to get up to two free swatches on our site just by adding them to your cart. All the details are HERE. [Note to folks outside of the US: Eastern Time is the same as New York.] We're also using this as an excuse to harness a little of the power of our amazing community of crafty peeps to raise money for a terrific organization called Heifer International. We'll keep you posted here on how much money we raise, but let me just say now that we're hoping at least to come up with enough to buy a couple of llamas.